A tutorial packed with tips for building a script or command line tool using Node and npm, from parsing command line options to rendering colored output and progress bars. A 30 minute Nodevember talk by Jordan Kasper that walks through some strategies for testing Node apps using Mocha. Visual Studio Code is a code editor built by Microsoft. It’s mostly written in TypeScript and runs as a desktop app using Node and Electron. 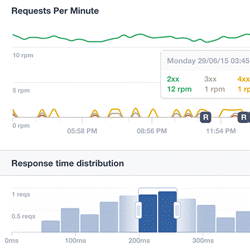 Opbeat, the simple performance monitoring tool for developers, is now available for Node.js. Opbeat is integrated with your codebase makes monitoring and debugging your production apps faster, and your code better. Sign up to the private beta here. Visual Studio based developers rejoice. Now includes a Quick IntelliSense mode, better debugging, npm 3 support, Code Snippets support, improved performance, and more. Mostly minor upgrades and updates. npm and http_parser have been upgraded, and a few core packages have had bugs fixed. I doubt npm will be toppled soon, but it’s great to see new ideas in package management come along and get absorbed. “We’ve got a network utilization regression that’s at the root of the npm3 install performance.” This is a very extensive dive. A set of 9 videos following the course provided by the ExpressWorks app, a local, interactive tool that helps you learn Express.js. Submit custom metrics using our http API or the Singly node bindings. See them in Datadog for graphing, analytics, and correlation.